Tech Cool 35052CF is a Generation V, heavy-duty, bio-resistant premium grade semi-synthetic metal working fluid designed for machining and grinding. 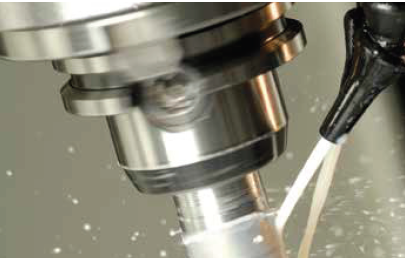 Tech Cool 35052CF is specifically formulated for those facilities machining aluminum, titanium, inconel and other difficult to machine alloys, but fully compatible, and non-staining with all substrates, making it ideal for multi-metal systems. Tech Cool 35052CF achieves the ideal blend of high lubricity with unsurpassed micro-emulsion stability resulting in aerospace performance levels with exceptional sump life. Tech Cool 35052CF is formulated to provide protection against the growth of bacteria without the use of bactericides, DCHA or other secondary amines. The high detergency components aid in system cleanliness, minimal residues and reduced consumption. Tech Cool 35052CF is low foaming, provides superior corrosion resistance and rejects tramp oils effectively. Tech Cool 35052CF is approved to Boeing Aerospace BAC 5008, Usage Areas 5 & 6.